POCHOIR & THE POCKET-LINK BOOK! Have a look at an exciting upcoming workshop with the SEGBW! This class introduces a clever book structure and a versatile image making technique to create content for it. Students will produce pochoir samplers using Hedi Kyle’s pocket-link book design. We will first cover a variety of ways to make atmospheric, layered images using hand-cut stencils, and put these pochoir techniques to use on translucent paper. During this step, there will be opportunities to collaborate and expand the variety of potential images by swapping stencils with others. The book will then be constructed with built-in pockets to store the stencils themselves, making them part of the visual interest and content of the book. 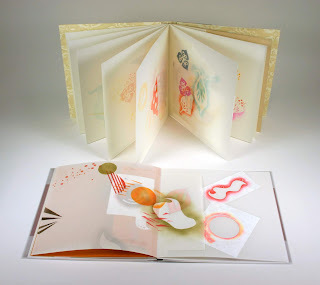 Hedi Kyle’s unique structural inventions, such as the pocket-link book, have had an enormous impact on the field of book arts, and this project is from her own teaching repertoire. Artists far and wide continue to be inspired by her masterful paper engineering and particular genius for transforming the architecture and action of the book. No previous experience required.